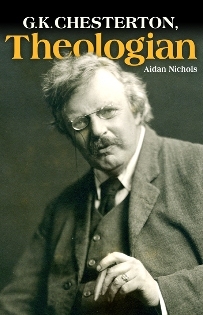 G. K. Chesterton, Theologian by Aidan Nichols O.P. Fr. Aidan Nichols, O.P., of Blackfriars, Cambridge, is a lecturer in Cambridge niversity and the most prolific writer of theology in the English language. He has published on countless topics, especially in systematic, sacramental, and ecumenical theology, and was awarded the title Sacrae Theologiae Magister by the Dominican order in 2003. His books include important studies of St. Thomas Aquinas; modern thinkers, including Hans Urs von Balthasar; and the theology of Pope Benedict XVI. He has written on the liturgical “reform of the reform” and on “re-energising the Church in Culture,” as well as on the arts and iconography. The present book is based on a series of lectures given as the John Paul II Memorial Lecturer at the University of Oxford — the first Catholic Lectureship created in the university since the Reformation. This study has a straightforward form. The book falls, in effect, into two halves. The first opens by offering an overview of Chesterton’s life, an overview that already identifies some salient intellectual themes. Chapter 2, on the Edwardian writers who were his earliest controversial opponents, chiefly explores materials found in his first major work, Heretics. Chapter 3 centres on Orthodoxy, which Chesterton intended to be read with Heretics in one’s other hand,z though it also ranges more widely in detailing Chesterton’s “discovery of metaphysical realism,” his version of Catholic Christianity’s philosophia perennis. Chapter 4 investigates the most distinctive of Chesterton’s imaginative and argumentative strategies, the paradox. So winning a statement should not go without its theological reward. When Blake lived at Felpham angels appear to have been as native to the Sussex trees as birds. His patriarchs walked on the Sussex Downs as easily as if they were in the desert. Should we simply say, then, asks Chesterton, that Blake was mad? No doubt we shall contend with this “very big thing” — if disproportionate fears of terrorism do not prevent us — in a gentlemanly and sensible fashion. As Chesterton put it in his Autobiography, “sleepy sanity” is a typical English trait.25 Sometimes, however, we need a wake-up call — of the kind given by the Victorian giants on whom he wrote so well: Ruskin, Carlyle, Morris, Newman, and the rest. The remainder of this book seeks to show that “Chesterton’s theology” is just that. 1. Christendom in Dublin (London, 1932), 41-42. 3. Christendom in Dublin, 43. 6. William Blake (London, 1910), 74. 8. The Complete Father Brown Stories (London, 1992, 2006), 431. Conversion of England (Oxford, 2008), 110-118. 12. What I saw in America (London, 1922), 284. 15. Come to Think of It (London, 1930), 129. 16. The Victorian Age in Literature (London, 1911), 31. 17. Come to Think of It, 242. 19. The Victorian Age in Literature, 73. 21. The Victorian Age in Literature, 77. 25. Autobiography (London, 1936), 35-36. Clerihew Bentley, inventor of the minor genre known by his middle name. “The people of Spain think Cervantes/ Equal to half-adozen Dantes,/ An opinion resented most bitterly/ By the people of Italy.” Unlike his friends, however, Chesterton did not attend Oxford or Cambridge. He had shown minimal academic as distinct from intellectual ability. Instead, following his own inclination and with parental encouragement, he attended drawing classes and subsequently the Slade School of Fine Art, at that period a department of University College, London, where Chesterton also took some non-examined courses in English and French and, for a short while, Latin. After a year, he was asked to leave, since his teachers considered they had failed to teach him anything beyond the skills of decorative and grotesque drawing skills he already possessed. More widely, Chesterton’s dip into the waters of fin-de-siècle aestheticism gave him an aversion to any version of “art for art’s sake,” an aesthetic, he thought, that licensed a willful departure from the real — both in the sense of showing a lack of respect for given natural forms and in the sense of departure from moral norms themselves warranted by humanity’s good sense. That is a motif of his first published work, Greybeards at Play, a collection of comic verse subsidized by his father.W. H. Auden thought it some of the best of its kind in English. Deep in the hissing ocean. Given his allergy to mediums and ouija boards, it was ironic that Chesterton’s first job on leaving the Slade was for a small Bloomsbury publisher specializing in spiritualism and the occult. He soon got through a backlog of manuscripts submitted, sending them back to, as he put it, “addresses, which I should imagine, must be private asylums.”38 After a few months of this he was able to get a post with a mainstream publisher, T. Fisher Unwin, later taken over by Ernest Benn. Chesterton’s courtship of his future wife, Frances Bloggs, the first dogmatico-sacramental Christian he appears to have met (she was annglo-Catholic), and the launching of his career as a reviewer in London journals began now, in 1896. By the end of 1900 he was selling articles to London papers on a regular basis. The second component was Socialism, which later yielded to Distributism, notably under the influence of Hilaire Belloc, who was as opposed to Socialism as he was to Capitalism. In his autobiography, Chesterton explains that he became a Socialist only because it was intolerable not to be, granted the chaotic consequences of over-industrialization and the increasing penury, with the agrarian depression lasting from the mid 1870s to the mid 1890s, of the rural proletariat. as Chesterton began to approach the latter, he started to part from the former, as his notebooks bear witness. In the course of writing in 1904 a study of contemporary intellectual trends, under the title Heretics, where Blatchford continued to figure, Chesterton found there were a number of Blatchfords of differing kinds. He judged that the reasons for which Christianity was thus attacked from all sides were in many respects contradictory. This was so, he thought, not only in the negative sense of the objectors cancelling each other out but also in the positive sense that their opposite objections pointed to something uniquely balanced and fitting to the human condition in evangelical and catholic orthodoxy — and what a later generation would call “orthopraxy”: right practice. Chesterton was not a pacifist, as his broadsides against the Russian novelist and popular philosopher Leo Tolstoy made plain. The War brought great grief to Chesterton nonetheless. The death of his brother Cecil in a fever hospital in northern France (“trench fever” was a frequent killer in the grim fighting conditions of the Western Front) robbed him of his only surviving sibling. In due course, a curious exchange of gifts took place. Gilbert took over Cecil’s journalistic enterprise as editor of what would later become G.K.’s Weekly. Cecil passed on his (Roman) Catholic faith. Not, however, quite yet. Before looking into that imaginative achievement in the body of this book, we need to complete this overview by a retrospect on the (Roman) Catholic period of Chesterton’s life. Chesterton’s move from Anglo-Catholicism to the Church of Rome was motivated by concern for legitimate authority. After all, this had been the nub of the issue between Jesus and the Jewish leaders of his time: where and how was divine authority to be accessed in historical society? As early as 1909, when the third of Chesterton’s novelistic fantasia, The Ball and the Cross, was published, with a Highland Catholic as its quasi-hero, rumours had circulated that Chesterton was to convert to the Church of Rome. Shortly after The Ball and the Cross appeared, Chesterton discussed his spiritual concerns with two Catholic priests who struck up a conversation with him at Coventry railway station, saying, “It’s a matter that is giving me a great deal of agony of mind.”62a The likely effects of such a move on his non-Catholic wife served as a strong deterrent to Chesterton’s conversion. In the last weeks of 1914 Chesterton had suffered a serious stress-induced illness, provoked by his gruelling schedule of evidence of corruption in public life.) It was an unhappy period, characterised by some atypically acerbic journalism and a sharpening of his remarks about the nefarious activities, real or imaginary, of Jewish financiers based on the high-level skulduggery of the “Marconi Affair” (1911-1913), of which a very full account is given in the biography of Chesterton by Alzina Stone Dale. 62b In this severe medical crisis (for a while he was thought unlikely to recover) his wife Frances was reconciled to summoning Father John O’Connor to receive Chesterton into the Catholic Church by administration of the last sacraments in the event that his condition worsened.63 In fact Chesterton recovered, and it took another eight years before he steeled himself to make the move without his wife. He would take such thoughts further in The Catholic Church and Conversion, published following his wife’s reception into the Faith in 1926. Typical themes of Chesterton’s maturity were the imaginative and argumentative defence of historic Christianity in its dogmas, practices, and saints, Distributism (in 1926 G. K.’s Weekly became the official mouthpiece of the Distributive League, and Chesterton the League’s President 74), and, most fundamental of all, the thesis that man was not merely an animal who had evolved from a primitive life-form but a special creation, in the image of God. Though not all Chesterton’s biographers approve, his own Autobiography ends, in fact, with the affirmation that his reception into the Catholic Church was absolutely decisive for him: “[T]his overwhelming conviction that there is one key which can unlock all doors brings back to me my first glimpse of the glorious gift of the senses; and the sensational experience of sensation . . .”75 Chesterton had sought to recapture this “glimpse” in Orthodoxy and elsewhere, and he registers, in the book’s closing words, a curious correspondence between a figure in his father’s toy-theatre and the Peter whose vicar is the pope of Rome. In his copy, given him by the author, of Sir Oliver Lodge’s The Substance of Faith Allied with Science: A Catechism for Parents and Teachers, by the side of the question, “What is the duty of man?” Chesterton pencilled in his own answer: “To love God mystically and his neighbour as himself.”78 Let that, then, be his epitaph. that in his study of Stevenson he ascribes to the Scots novelist’s own childhood love for them the origin of the “special style or spirit” of his work in its clarity of form and characterization. “In that little pasteboard play, there might be something of the pantomime, but there was nothing of the dissolving view” (Robert Louis Stevenson [London, 1927], 50). 27. Cited in M. Ffinch, G. K. Chesterton (London, 1986), 13. 29. Cited in M. Ward, Gilbert Keith Chesterton (London, 1945), 42. 30. A miscellaneous collection of documents now in the G. K. Chesterton Archives in the Manuscripts Department of the British Library. thrones, and dominations was an ancient and perilous sin,” A. S.
33. Cited in M. Ward, Gilbert Keith Chesterton, 62.
analysis of Chesterton’s attitude to Impressionism, see J. D.
36.“On the Disastrous Spread of Aestheticism in All Classes,” in J. Comic Verse (London, 1974), 42-47. 37. The Victorian Age in Literature, 8-9. 38. Cited in M. Ward, Gilbert Keith Chesterton, 67. 39. Cited in M. Ward, Gilbert Keith Chesterton, 110.
in Christian Socialism (London, 1967), 120. 44. Cited in M. Ward, Gilbert Keith Chesterton, 74. 47. What I Saw in America, p. 127.
in the Church of England (London 1946), p. 167. 51. M. Ward, Gilbert Keith Chesterton, 172. 52. What I Saw in America, 244-245. 53. A. Roberts, Salisbury: Victorian Titan (London, 1999, 2000), pp. 54. All Things Considered (London, 1908), 97. Study in Art and Propaganda (London, 1975). 60. Cited in M. Ffinch, G. K. Chesterton, 111.
of Christian holiness of life, something not obviously impossible. of Lisieux, declared doctor ecclesiae by Pope John Paul II in 1997. 62a. Cited in M. Ffinch, G. K. Chesterton, 183. 62b. A. S. Dale, The Outline of Sanity, 168-183. 63. M. Ward, Gilbert Keith Chesterton, 330. 67. Chaucer: A Study (London, 1932), 341. 68. Collected Poems (London, 1933), 387. Novels of G. K. Chesterton, 79-83. 70. Cited in M. Ward, Gilbert Keith Chesterton, 390. 71. Cited A. S. Dale, The Outline of Sanity, 225. 72. The Resurrection of Rome (London, 1930), 283. 73. A. S. Dale, The Outline of Sanity, 288.
title by A. S. Dale in the previous footnote. 77. D. L. Sayers, Preface, The Surprise (London, 1952). 78. O. Lodge, The Substance of Faith Allied with science: A Catechism for Parents and Teachers (London, 1907), 129. I thank Mr. Stratford Caldecott of the Chesterton Library in Oxford for showing me this item in the collection of Chesterton’s own holdings. The above extract is reproduced with the kind permission of the uk publisher of this book, Darton, Longman and Todd.